Sri Villas, a fully-staffed trio of boutique seaside properties, share a tropical garden, a large swimming pool and direct beach access. Sleeping 18 in total, these villas are perfect for large groups and for entertaining. Each is fully self-contained with its own living areas, dining space and kitchen. 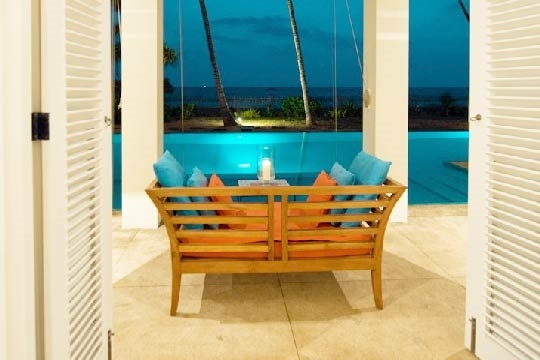 Araliya, Nisala and Sagara are Sri Villas’ trio of boutique properties that stand shoulder-to-shoulder facing the sea. Sharing a tropical palm-shaded garden, an expansive swimming pool and a welcoming staff team these villas can sleep up to 18 people and are ideal for hosting large companies of families and friends. 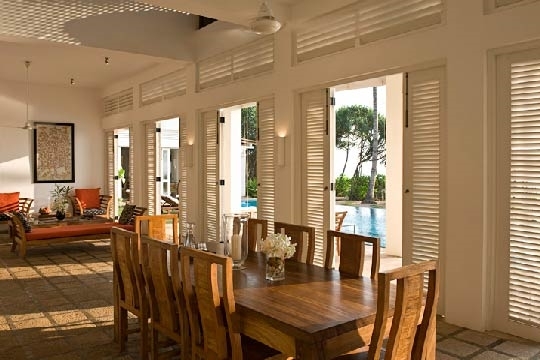 The three owners of Sri Villas, themselves lifelong friends, built the property with this in mind since they had always enjoyed the sociability of communal holidays. The shared surroundings and collective facilities benefit many larger mixed age groupings whilst the fact that each villa is self-contained gives individuals or family units their own privacy and individuality too. 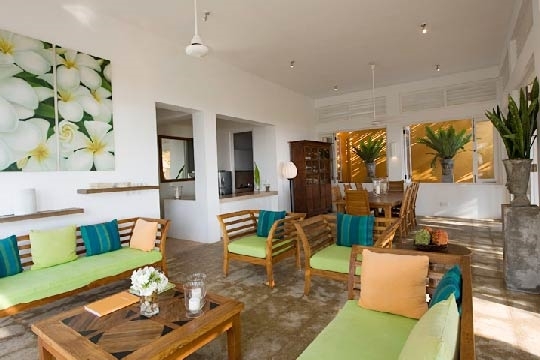 The villas can be rented individually or as a group of three. Each contemporary villa comes with its own living and dining space, fully-equipped kitchen and terrace that spills onto the tropical garden beyond. 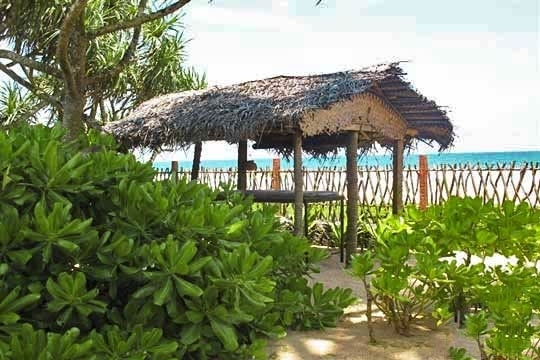 A little rickety gate to the front of Sri Villas leads onto a wide golden beach that stretches for half a kilometre between two rocky outcrops; it’s mostly deserted except for the odd fishermen, the occasional turtle and a scattering of strollers at sunset. You can swim and body board in the sea here during the November to April season although the villa’s inviting lap pool is an absolutely glorious place to while away the hours of the day, and faces right out towards the sunset; its generous size is definitely a bonus, as you can really enjoy a proper swim. 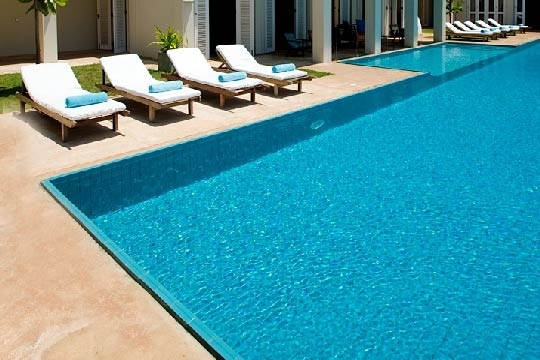 Sri Villas is a great place for entertaining since the palm-shaded garden and glorious wide sandy beach offer ideal locations for celebrating birthdays, reunions and of course, hosting intimate tropical weddings too. 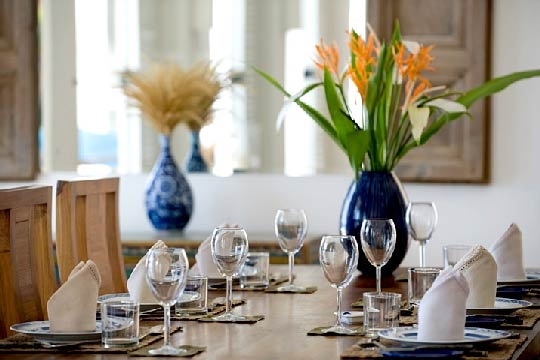 Offering nine rooms in total these cosy villas can conveniently accommodate all party guests which makes the effort of organising an event much easier whilst the villa’s grocery system for food means that it’s very economical as you pay for all food and drink at cost price. The chef has his own kitchen so when you do choose to be catered for, you still have the run of the villas to yourself. There’s an efficient staff team looking after the whole property with one houseboy assigned to each villa for continuity and ease. This is Sri Lanka’s best choice for large groups and for entertaining. This is definitely Sri Lanka’s best choice for large groups and for entertaining as the property has been designed so well for big parties. The genial setup means that villas are placed at just the right distance from each other to allow for conviviality whilst their individual self-containment means that family units within a group can still enjoy a degree of privacy if they need to. Sharing one big swimming pool between the three villas works out better than having three smaller pools, allowing for lengthy swims. There’s a shallow section in front of Nisala that you access directly from the villa’s terrace, making it a focus for families and therefore the busiest area of the pool. 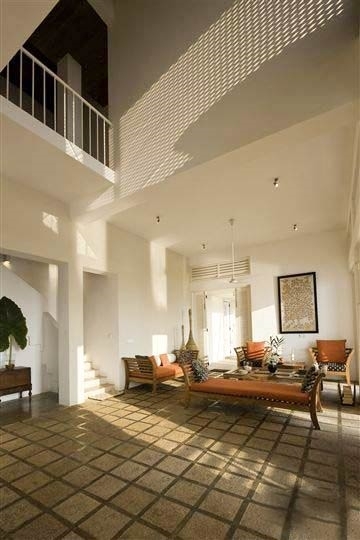 Verandas and balconies offer quiet spots for individual moments if you need to get away from the crowd. We found the staff team to be very able; the food was good (there was lots of choice), the smiles genuine and their experienced system of dealing with guests shone through. I liked that fresh juices were left in the fridge for us to help ourselves to (or brought to us in chilled glasses) and that we could order whatever we liked, when we liked. Typically guests choose to pay their food bills via a grocery system (staff doing the shopping and presenting you with receipts), which we did; however you could otherwise opt to pay $40 per person per day for full-board. 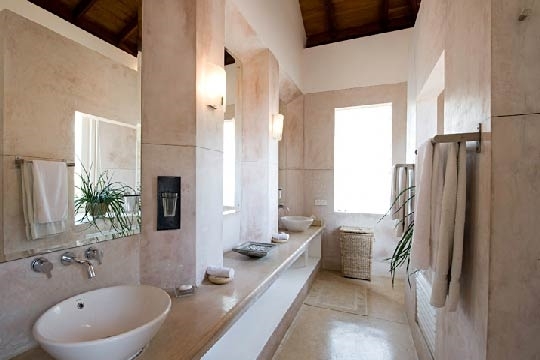 The villas are genially designed for groups and nearly all bedrooms have views of the sea. They are situated on a great beach which they have direct access onto and there are lots of activities, attractions and conveniences nearby. 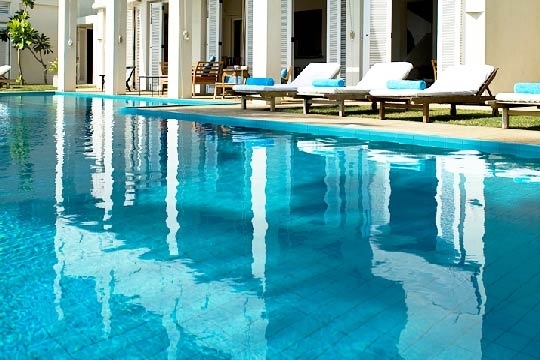 The staff are used to hosting functions – they can arrange for elephants, Kandyan dancers, drummers, registrars and caterers for bigger parties - so these villas are perfect for celebrating special occasions such as birthdays, reunions and weddings. We didn’t think that there were enough sun beds to go around but, as there never seemed to be a time when they were all being used, it wasn’t an issue. 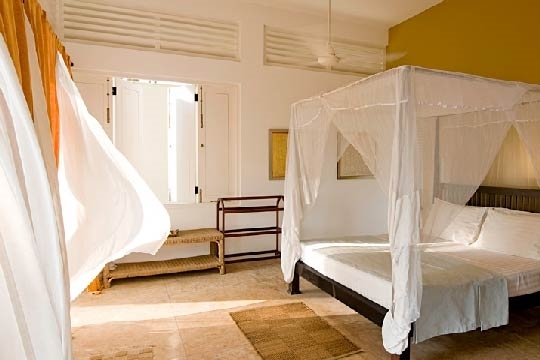 Araliya is the closest villa to the staff area and as such has a little less privacy than the others. The hot water tanks in Nisala were evidently too small as there was not enough water for two consecutive showers. 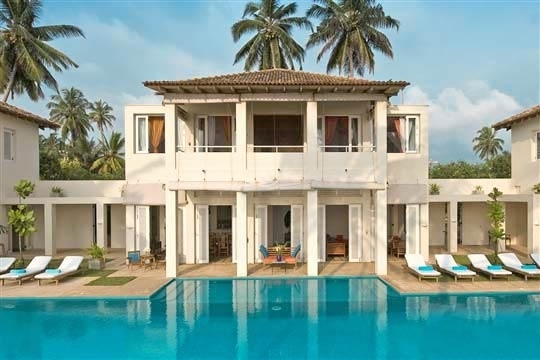 Sri Villas are located between the main Galle Road and an extensive golden sandy beach to the south of Induruwa, only a ten minute drive to the famous resort of Bentota. 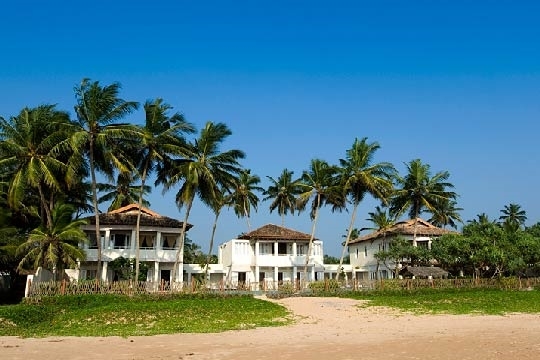 Village homes in Induruwa are generally strung out along this stretch of coastline with small boutique hotels and bigger resorts scattered in between. Because of the southwest monsoon, it’s best to visit between December and April as the sea can be rough and the winds strong at other times of the year. Bentota’s sandy beaches, extensive lagoon and water sports activities have made this resort one of the most famous on the west coast. 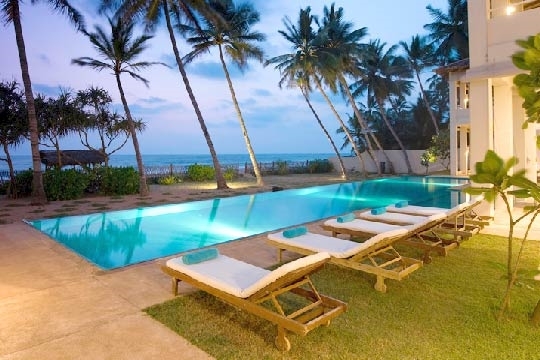 Upmarket hotels popular with package tourists fringe the beach and stretch along a dramatic sandbar washed on both sides by water; that of the Indian Ocean and the Bentota Lagoon. Jet skis whizz atop the tranquil waters of the lagoon dodging windsurfers and kayakers as well as speedboats pulling jet skiers, wake boarders and inflatables topped with soaked sun seekers. Many diving companies also operate from Bentota during the west coast season (November to April) whilst boatmen offer eco-adventures further up river. 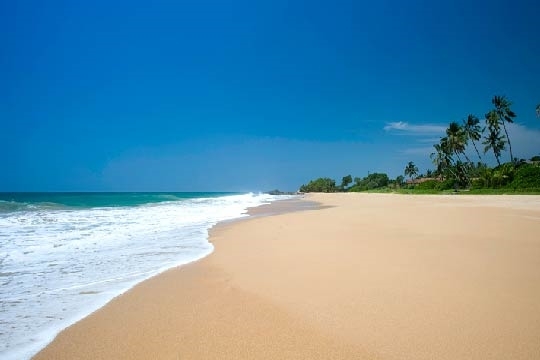 The best beaches are south of Bentota towards Induruwa where the crowds barely reach and where the best food can be found in the restaurants of a growing number of beautiful boutique hotels. Inland from Bentota the scene is engulfed by paddy fields, palm jungle, waterways and the odd hillock, which is often topped by a bright white Buddhist dagoba. Two very special gardens are to be found in Bentota’s hinterland, both of which belong to the late Bawa brothers; Bevis, the artist and Geoffrey, the architect extraordinaire. Bevis’ Brief Garden is at Kalowila and comprises intimate walled gardens plus a very special collection of art, whilst Geoffrey’s Lunuganga is a much bigger and more spacious Italianate garden with views to die for. Connections to Colombo and Galle can be made from Aluthgama train station, which is just a couple of kilometres north of Bentota. Here banks with ATMs, bakeries and pharmacies can also be found. The west coast of Sri Lanka is the island’s original tourist hotspot, blessed with numerous picture-perfect gold sandy beaches that stretch as far as the eye can see. These wide beaches are fringed with hotels and restaurants often hidden below the tall, swaying palms. Sandy tracks lead to water-sport facilities, signs point towards intimate spa and Ayurveda centres whilst stone pathways take you to bijou shopping malls where a whole range of island memorabilia can be found. Local residents are friendly and never fail to offer their services; whether it is to take visitors bird watching inland, to a marine turtle hatchery such as Kosgoda, for a special temple tour, on a surfing safari in Hikkaduwa or on a scenic adventure up the Madhu Ganga River for a glimpse into Sri Lanka’s lush interior. Between the bigger resort towns, the beaches (Balapitiya to Kosgoda for example) are more unspoilt and often deserted except for a handful of sarong-clad fishermen and their multi-coloured boats. But no beach is ever too far from the main road. Look up to the skies and you will see that the coconut palms in this western region, especially around Bentota, are often connected by tightropes used by toddy tappers - men who climb into the trees to obtain the sweet, milky sap of the coconut blossom that is distilled into the local alcoholic brew, arrack, which you must try at least once! Just a short distance inland the scenery bursts with different shades of green as paddy fields, coconut and rubber plantations, verdant hills, lush valleys, mangroves, lagoons and foliage-covered buildings represent an authentic Sri Lankan village scene. 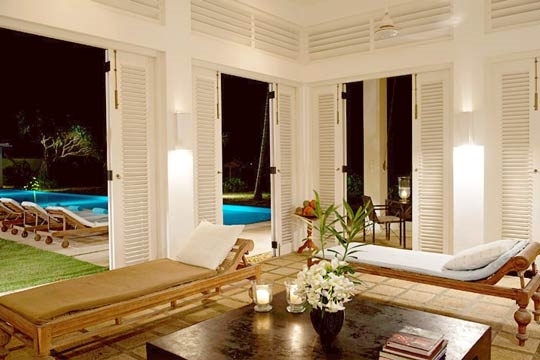 Each villa has a different room configuration and is sited around the swimming pool. They come with their own equipped kitchens, a veranda to the front and a sea view balcony on the first floor that’s shared between the upstairs bedrooms. 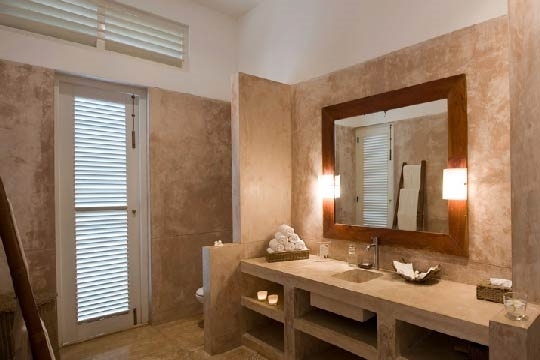 All bedrooms come with their own bathrooms which feature granite sinks and hot water showers. 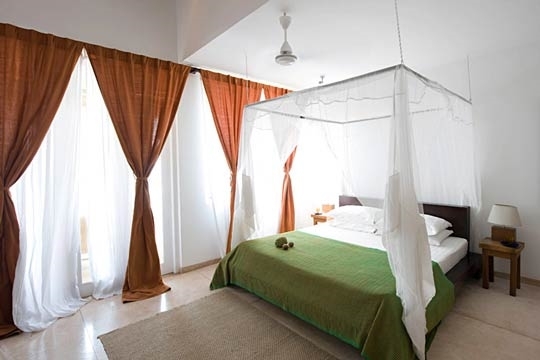 Araliya is the largest villa having four air conditioned bedrooms. On the ground floor is a spacious living and dining area with folding glass doors that open onto a front and side veranda furnished with easy chairs. Sofas are placed inside looking towards the swimming pool whilst the dining table for eight is positioned a little further back beside a semi open-plan kitchen. There are two bedrooms on the ground floor – a double and a twin - both of which are best suited to children. The twin bedroom features a TV with DVD player so could be used communally for watching movies. On the first floor are two identical double master bedrooms. To the far side of the swimming pool is three-bedroomed Sagara . 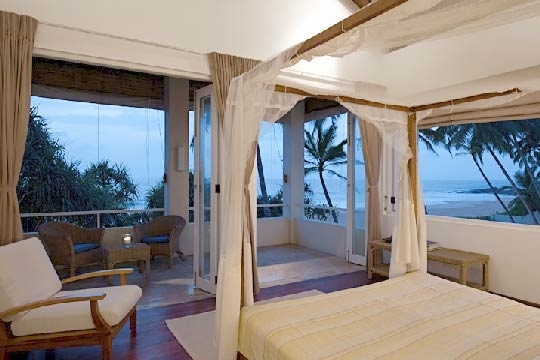 Each of the bedrooms in this villa is equitably sized and opens to views of the sea. The two upstairs bedrooms are air conditioned doubles whilst the ground floor bedroom that opens from the shared living and dining area is fan cooled with louvered doors to the front allowing the breezes to circulate and cool. Relaxing loungers scatter the living area that overlooks the swimming pool and sea whilst a dining table for eight is placed privately towards the rear of this room. The kitchen leads off from the living / dining area. 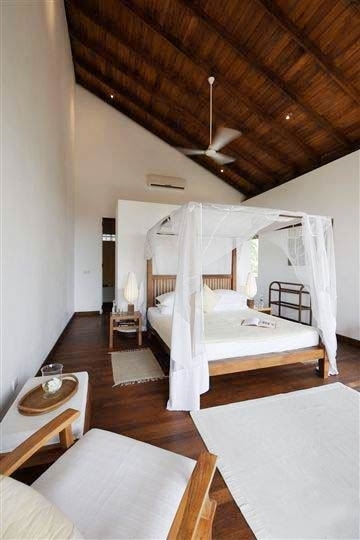 Nisala is situated between the other two villas and is set a little further back. Nisala has two upstairs air conditioned double master bedrooms and a huge open plan living and dining space on the ground floor that makes a great location for inside entertaining; three dining tables can easily be pushed together here for special occasions. To the rear is an open kitchen with front bar whilst a dining table for eight to one side and comfortable lounge seating to the other all overlook the swimming pool and sea through louvered folding doors. The villa charges a USD100.00 fee for each change after a booking has been confirmed and a deposit has been paid. Upon arrival at the villa you are required to pay a security deposit. The security deposit will be returned to you prior to departure less any extra charges or costs for accidental damage to the property. The security deposit is equal to a half-day's rent if you are staying for less than 1 week or a full day's rent if staying for 1 week or more. The villa only accepts payment by cash. Wood carving shop with lots of fishermen statues, sculpted elephants and masks. There is an attached workshop where you can see the wood craftsmen in action. This spa with branches in hotels in Colombo, Bentota and the Maldives offers a number of rejuvenating therapies from massages, wraps and scrubs to beauty treatments including facials, manicures and pedicures. This alternative to deep sea fishing, especially during May to October when the rough seas are off limits, also offers glimpses of riverine scenery. Boats are fully equipped, and fish to be caught include mangrove jack, snapper, cat fish and mullet. Head off down the Bentota River to see crocodiles, monitor lizards, bird of prey, kingfishers and giant fruit bats. Trips include a journey through a beautiful mangrove swamp. Head into Bentota village to explore this rural inland hinterland. You can visit a Buddhist temple and also stop off at Lunuganga for tea. Guided tours are organised through Malu Banna, but they also provide bicycles for hire should you like to explore on your own. Head to Induruwa Reef and Handharian Gala (rock) accompanied by a trained scuba diving instructor. All equipment is provided and the boat trip affords for stunning coastal views. Catch your own fish for dinner; the sea teems with jackfish, barracuda, tuna, red snappers, wahoo, kingfish and sailfish! Head out deep sea fishing on a fully-equipped boat with GPS, life jackets and a toilet. Trips run for four hours and depart at either 6am or 2pm. Next to Silk Route, this restaurant beside the Galle Road 3km south of Bentota has air-conditioned seating inside and on the terrace, fan-cooled tables. The menu has an international theme with a focus on grilled meats, fish and seafood. This little market has a few shops selling a range of souvenirs including wood carvings, sarongs, beach clothing, postcards, spices and other touristy souvenirs. South of Bentota, Induruwa Beach is wide and very pretty, and thanks to an offshore reef swimming is safer here than many other west coast spots between October and April. This, legendary architect Geoffrey Bawa’s spectacular estate inland from Bentota, provides the most stunning setting for lunch or high tea, both of which must be pre-arranged. Enjoy rice and curry spreads or pick from a selective menu of a la carte meals. This magnificent 23-hectare estate was the residence of the late architect Geoffrey Bawa. Comprising a beautifully renovated old house, a number of gorgeously-positioned buildings and intertwining terraces designed to overlook the gardens and frame the views; this garden is a true inspiration. Tours are best culminated with a delicious rice and curry lunch or high tea. Little first floor restaurant beside the railway track and opposite The Surf Hotel serving excellent seafood in simplistic though sophisticated surroundings. Downstairs are a number of little shops selling souvenirs, crafts and sarongs. Malu Banna offer whale watching trips with transport included from Bentota, with pickups available at villas south down the coast to Ambalangoda, or further up north towards Beruwala (max 5km). The transfers take 2 hours each way, and the whale watching boats depart at 7am and 2pm daily. Tiny outlet of a beloved Colombo institution where you can pick up decorative design pieces, scented candles, leather-bound diaries and deliciously fragranced ayurvedic toiletries. A beautifully laid out luxury spa; treatments are carried out in private suites with sauna, steam shower, jacuzzi, flower bath, treatment room, dining pavilion and relaxing pavilion, and range from skin treats, facials, scrubs and wraps to ayurvedic treatments, hot stone massages and reflexology. Beautifully positioned restaurant and bar on a rocky promontory with spectacular views of the northern and southern coastline as well as the sea. The food is some of the most expensive in Bentota, but it’s good and there’s lots to pick from on the menu. Address : Galle Rd, Bentota South (250m south of Escoffier restaurant). Identify Sri Lanka’s five species of endangered marine turtle in tanks, along with hatchlings and buried mounds of eggs that are safely protected until the babies are ready to emerge. Sri Lankan short eats – filled bread snacks, savoury pastries and sweet snacks – are found on the ground floor whilst upstairs Sri Lankan buffets are put on for breakfast, lunch and dinner. Very reasonably priced and perfect for a quick bite to eat. This restaurant within a beautiful boutique hotel serves up an exciting International menu of dishes sourced from their famed Gallery Café restaurant in Colombo. Seafood is a speciality (for platters order 24 hours before), there’s a wood-fired pizza oven and desserts are numerous. Go windsurfing (VDWS courses available with ex-Sri Lankan champion), surfing, waterskiing, wakeboarding, body boarding, banana boating, tube riding, jet-skiing and deep sea fishing with one of the most established water sports operators in Bentota. 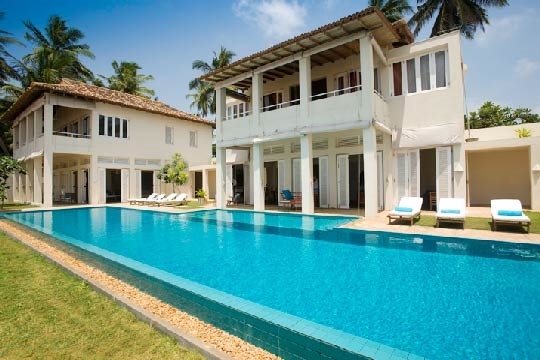 9 bedroom villa located in Bentota, West Coast. Ideal for Beachfront, Body and soul, Bring the relatives, Kid friendly, Fair share for groups, Party pads, Sensible for seniors, Room with a view, Perfect for weddings.